Create a unique modern dining space with this counter height table. 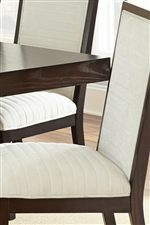 The table is crafted from hardwood solids with quarter cut ash veneers, and finished in a rich brown color. Clean lines and a floating pedestal give the table a distinct modern feel that looks sleek and sophisticated. One included leaf lets you extend the table length for extra seating space. The Antonio Counter Height Pedestal Table by Steve Silver at Walker's Furniture in the Spokane, Kennewick, Tri-Cities, Wenatchee, Coeur D’Alene, Yakima, Walla Walla, Umatilla, Moses Lake area. Product availability may vary. Contact us for the most current availability on this product. AT700PB Counter Height Table Base 1 0" 0" 0"
Leaves 18" Table Leaf Extends Table Length From 70" to 88"